Angelica by Noriko for Rene of Paris has stunning, long textured layers falling to the mid-back. Angelica features a breathable cap construction for an all day comfortable wear. - Overall: 26.4", Fringe: 8.0", Crown: 16.2", Nape: 16.0"
Angelica is a gorgeous, masterfully-crafted work of art at an amazing price. This wig is very popular and will never go out of style. She is a world wide best seller for many years running. Traci M. Reviewed by Traci M.
Loved this wig....I’m really new to wigs and I have my own bio hair, but wanted to try new styles. I guess I have a large head cause I had to cut the adjusters off. Still think this is great especially for the price I paid. Kathleen E. Reviewed by Kathleen E.
I really like this wig, even with it being a basic cap, it looks great on. I also like that it is kind of straight, so when the ends kind of frizz I can either trim them or steam them straight. I'm really glad I went for it! Janine P. Reviewed by Janine P.
She's gorgious, and mochachino-R is a beautiful natural looking dark blonde/light brown. I highly recommend this color for Angelica, because the darker roots and sedate color will help with realism. 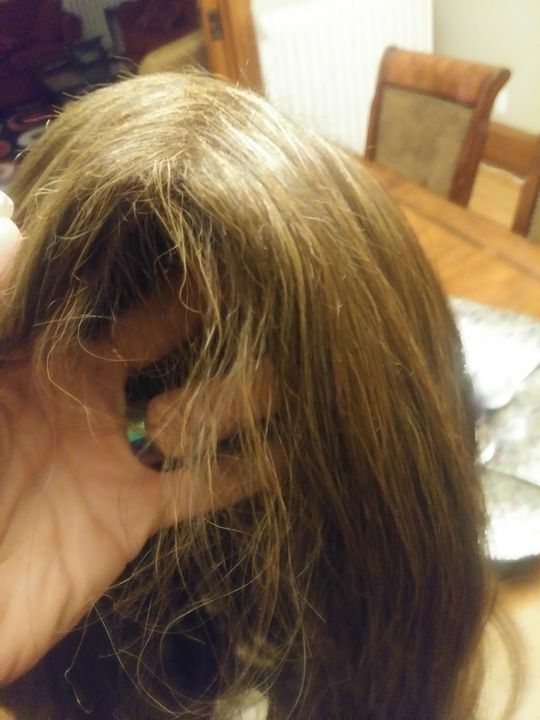 This is not an everyday wig for me, since she is quite long and her permateeze and cut give her a glamourous look which is too seductive for my daily wear. Because she iis a basic cap, no lace front or mono features, she can look wiggy, that's why I recommend you order her in the most believable color you personally. Hi, this is my third wig of the same style and make, I love the style, I love the color, however it kinked and frayed within 3 weeks. All three of my wigs have done this. applying no heat using the right brush and I have not washed it yet. Being transgender my hair is the most important piece to my wardrobe because I cannot grow my own hair.so for the money I pay I would like something that will last me a while.